The Tunetown underdog, clamoring to prove himself onset as a true cartoon star, while vying to impress his starlet (and totally out of his league) wife, Jessica Rabbit. The hare with the polka-dotted bowtie and pink nose. The one framed for murder. With a garishly absurdist voice, this antihero was the animated star of the wacky 1988 live-action/animated hybrid comedy, Who Framed Roger Rabbit—a satirical ode to neo-noir and classic hand-drawn cartoons set in a fictional landscape modeled after 1940s Los Angeles. Its theatrical debut in the late ‘80s landed in a world where the film industry was eager to cultivate this allure of a blend of live-actors interacting with classic hand-drawn cartoons. The flick appeared around the time of the Michael Jackson desert boogie with a claymation figure in Moonwalker, and Paula Abdul’s dance-off with an ostentatious cool-cat. The short-lived cinema trend du-jour seemed to peak a little under a decade later with the release of cult classic Space Jam. 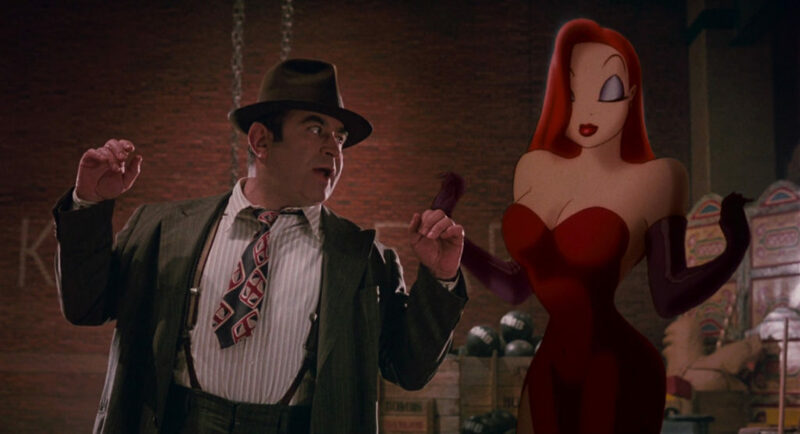 Interestingly, Who Framed Roger Rabbit’s anachronistic approach to a classically-styled Hollywood backdrop provides referential elements familiar to parents on one end, and cartoonish absurdity for the kiddies on the other. One of the more fun winks in the film finds Detective Eddie Valiant’s discovery that Roger’s wife, Jessica has been playing “pattycake” with another man. The bit is upheld with a nocturnal saxophone lick, but is really sold in the sharp cut to Roger being broke the news. The goofy hero weeps, before banging his head on a desk and being given a hanky. And that’s just one instance of the film’s dexterous audience consideration. Its famous opening scene pays tribute to a classic toon gag. A nameless mother-figure—who is only depicted from the knees down—leaves Roger in charge of a googly-eyed Baby Herman. As Roger gives chase, Baby Herman nearly offs them both with every conceivable dangerous utensil in the kitchen. Then the movie’s playful magic is unfurled. A non-toon director yells to cut the scene, entering the cartoon ‘set.’ The ‘real’ Baby Herman is revealed to be no baby at all, but a cantankerous actor who’s had it up to here with Roger’s inability to get the scene right. The scene works wonderfully for showcasing the films meta-sendup of Hollywood production. There is a manifest charm of Who Framed Roger Rabbit. The film’s costume styling nails the ‘50s noir tropes, which are immediately recognizable to most older audiences. Both detectives and devious bad-guy types wear long trench coats and fedoras. The look of the sleuth and the look of the deviant back-alley scoundrel. Jessica Rabbit’s characterization, in her over-the-top sequined gown, makes her what writer Alex Katz calls “the ultimate femme fatale” in his excellent article for Flixist which proposes that Who Framed Roger Rabbit is “one of the last great classic examples of film noir.” Jessica recalls the iconic jazz lounge image of the songstress, a dangerous liaison personified in neo-noir’s nihilistic existential worldview. Her depiction is both accurate to its film allusion, while summoning the archetype of the alluring bombshell from classic Tex Avery cartoons that literally made eyes bulge and dogs cat-call. Outside of an ethos that parodies the behind-the-scenes volleys of LA movie sets, while recalling classic noir, one of the primary plot backdrops is distinctly Los Angeles in a historical context. The plot finds Roger Rabbit framed in order to support a shadowy tycoon’s quest to flatten Toontown, in order to put in a new system of freeways. Comically enough, this point is headed by the idea that he’ll eliminate LA’s traffic jams. As true of the ‘40s and post-WWII LA, the once-widely used streetcar system found its eventual demise as the mass production of cars was spurred on by the demand for industrial jobs following the war. There’s even a long-standing alleged urban myth about greed and Los Angeles public transit, involving the rising powerhouse that would later become General Motors. Not-so-shockingly, a proxy-company of GM—National City Lines—bought out the streetcar lines in LA, eventually dismantling electric track infrastructure. There’s a moment of hilarious exchange when the villainous Judge Doom explains to detective Eddie Valiant what a freeway is. Valiant can’t imagine Toontown without its shiny red trolleys, and Judge Doom assuages Valiant by gushing about the new project’s gorgeous features: stretches of billboards, stacks of fast-food chains, hourly motels, and numerous on and off ramps. Doom is excitable like a child, and the satire totally lands for the audience. Eddie Valiant: A Freeway? What the hell’s a freeway? Judge Doom: Eight lanes of shimmering cement running from here to Pasadena. Smooth, straight, fast. Traffic jams will be a thing of the past! I see a place where people get off and on the freeway. On and off, off and on, all day, all night! Soon where Toontown once stood will be a string of gas stations, inexpensive motels, restaurants that serve rapidly prepared food, tire salons, automobile dealerships, and wonderful, wonderful billboards reaching as far as the eye can see. My god, it’ll be beautiful. 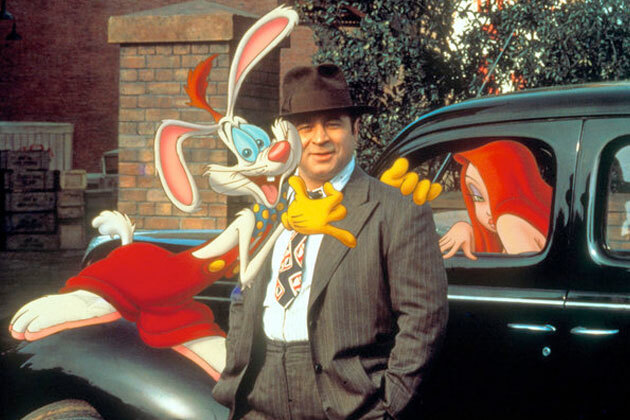 Ultimately, while the backdrop of the film is satirically an LA story thematically, revisiting Who Framed Roger Rabbit is as LA as superhero movies are New York. Essentially, it’s arguably a Hollywood send up with nods to those in Tinsel-Town’s general vicinity. Robert Zemeckis’s unique film is charming, playful, and hilarious. A re-watch gives pangs for a time when cartoons were hand-drawn, extravagantly slapstick, and a bit off-color. The traction is gained with its nostalgic cartoon tableaus and winks at behind-the-scenes Hollywood. The plot is made enjoyable by the toons-meet-reality setup. But in reality-meets-reality, its triumph is the witty execution of its namesake—the bunny with the overalls that tends to be forgotten: Roger Rabbit. The Hundreds X Who Framed Roger Rabbit collection is available now at The Hundreds flagship locations, Online Shop, and select authorized retailers nationwide. As one of The Hundreds’ co-founder Bobby Hundreds’ favorite films of all time, we are proud to bring the first-ever official Who Framed Roger Rabbit collection to life.